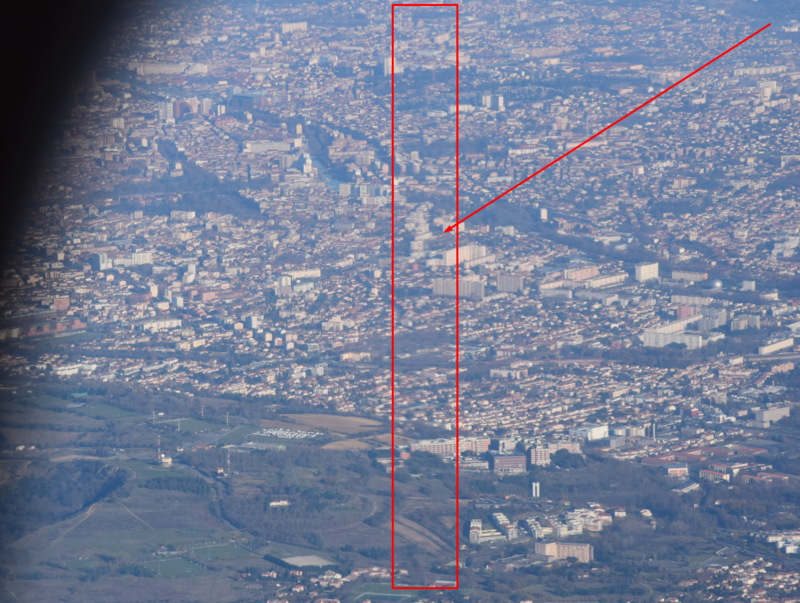 Long lens photography from the plane – how it works? 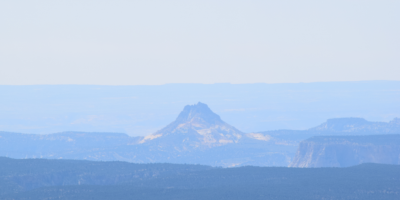 I very like to snap a remote objects and mountain outlines. Especially since I got the new telephoto lens – Nikon AF-S Nikkor 55-300mm f4.5-5.6 ED VR. Covering the distant sights from the ground is not only one option, that may give you a lot of positive feelings. 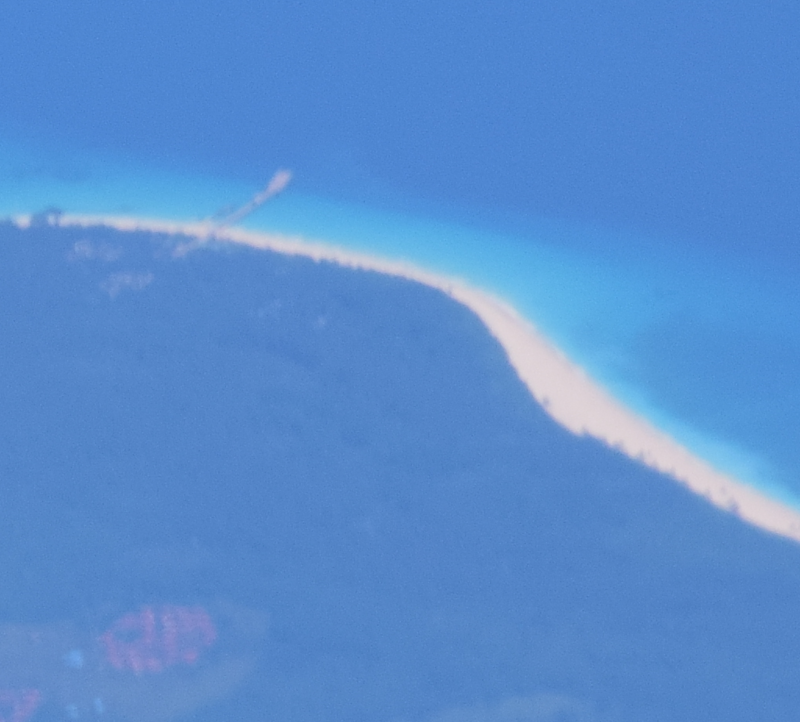 You can also enjoy a much bigger viewshed from the plane. You need a favourable weather conditions and appropriate position “quite” close to mountains (Pic.1). 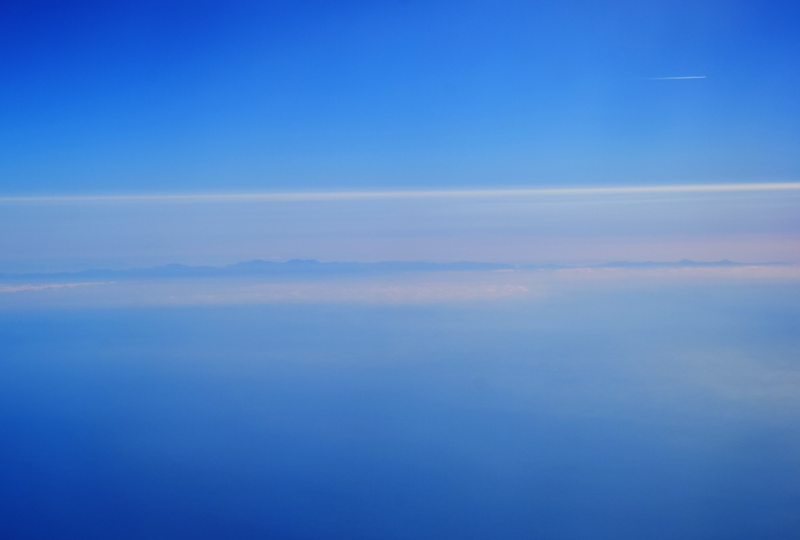 The aeroplane altitude, around 10000 m.a.g.l. gives you a viewshed up to approximately 360 km ahead! (Pic. 1) Taking into account, that some mountains are higher, than surrounded area, some line of sights may be much more extended (Pic. 2). However there are only mathematical patterns. Practically atmospherical conditions takes hold and calculated viewshed doesn’t guarantee the real possibility of view. Pic. 1. 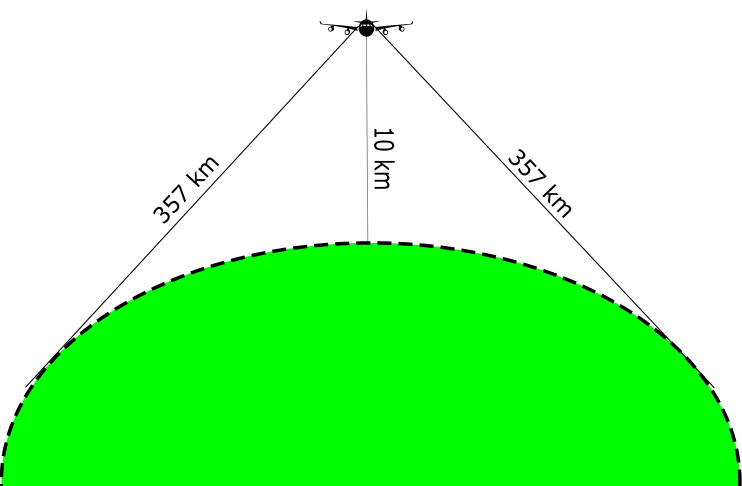 Typical altitude of flight – 10 km gives you opportunity to see the area 357 km ahead. Pic. 2. 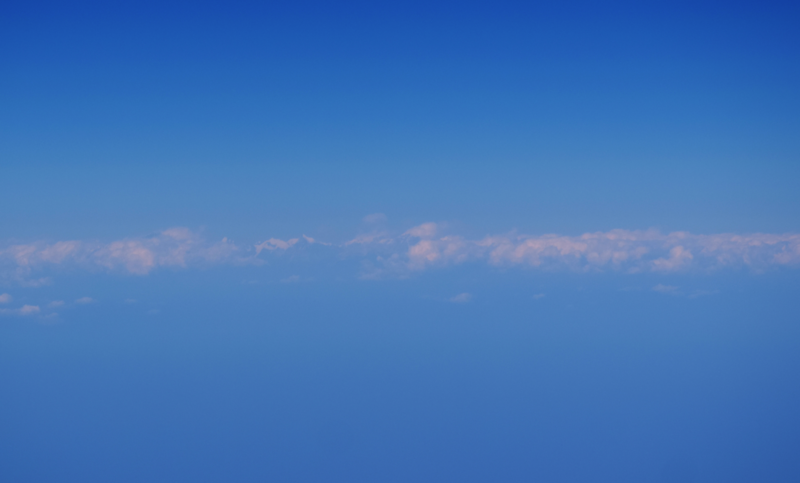 From typical altitude of the plane you can see very far objects, located even a few hundreds km from the plane. Moreover, the pic. 2 represents a simplified pattern only, because not always plane is flying above a sea level. 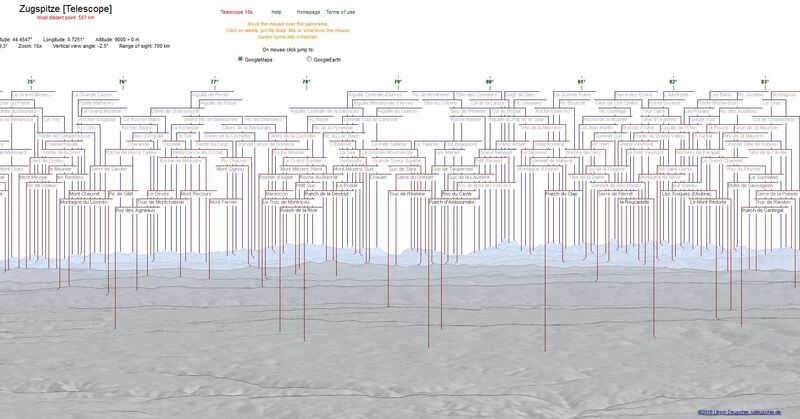 Anyway according to this graph as I said above flightseeing give us a long range viewshed. 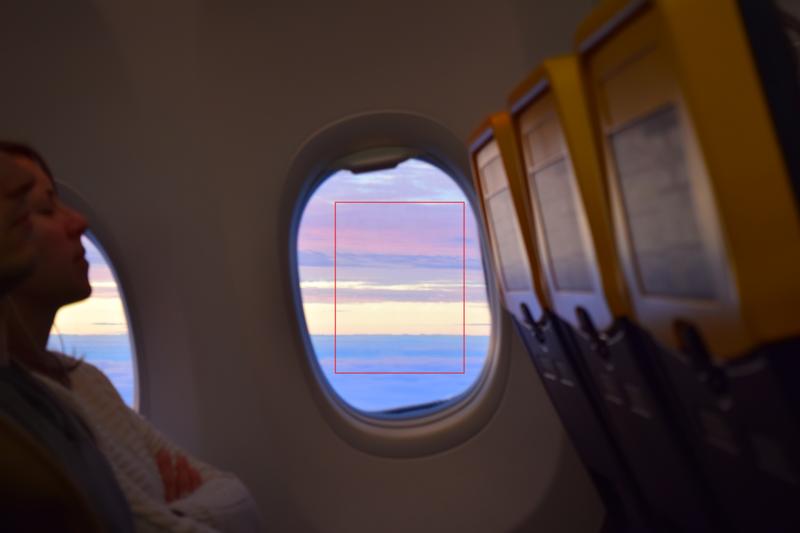 Let’s take a look on the photography conditions when being in the plane. More than year ago I said a few words about taking picture from the middle of the plane. However I took into account only planes like Boeing 737-800, that is 6 rowing plane. Today I would like to say more about the practising a long lens photography from the plane including the photography from the middle of the 9 rowing plane. First I would like to give the answer for taking picture in wide-body aicrafts with 8 – 11 seats across. In twin aisle aircrafts is much harder to take a picture from the middle. Your view through the window is confined only to narrow angle. In this case you are not able to see any details outside aside the closest and the most prominent clouds or aircraft turns (Pic. 3 – 5). Pic. 3. Opportunites to flightseeing in wide-body aircrafts: A (red) – view through the window from seats in row A; B (orange) – view from the seat in row B; C (yellow) – view from the seat located in row C; D-E (green) – view from the seat in inner row D or E, behind the aisle. Pic. 4. 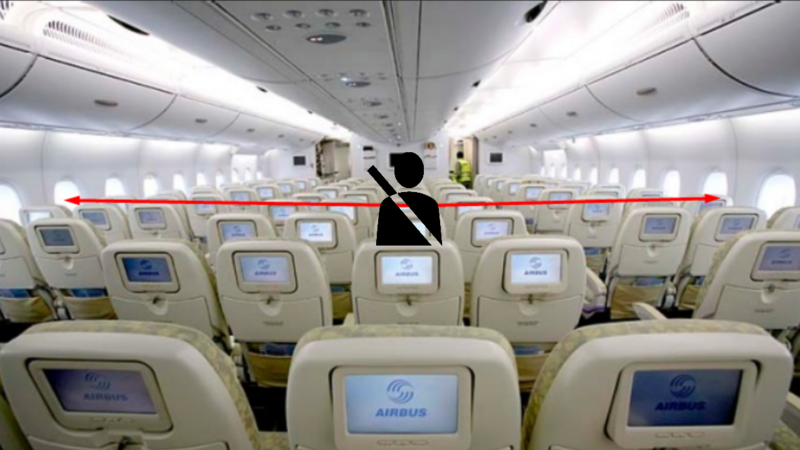 The example of seat located in the middle of the wide-body aircraft. Red line shows one possible angle ov view (seatguru.com). Pic. 5 When sitting in the middle rows the flightseeing is not possible. You have only narrow angle view (red arrows). Even if some view is possible at all it can be obstructed by another passangers, that are looking through the window or sleeping. Seats between the aisles are the worst and flightseeing is impossible from there. If some view is available at all, a barely improvement can be done when using long lenses. Let’s considerate a few examples below. First I would like to show you using a long lenses in flightseeing for the opposite part of the plane (Pic. 6 – 8). Pic. 6 My seat (red rectangle) during the flight from London (STN) to Toulouse (TLS) by Ryanair, FR 295. 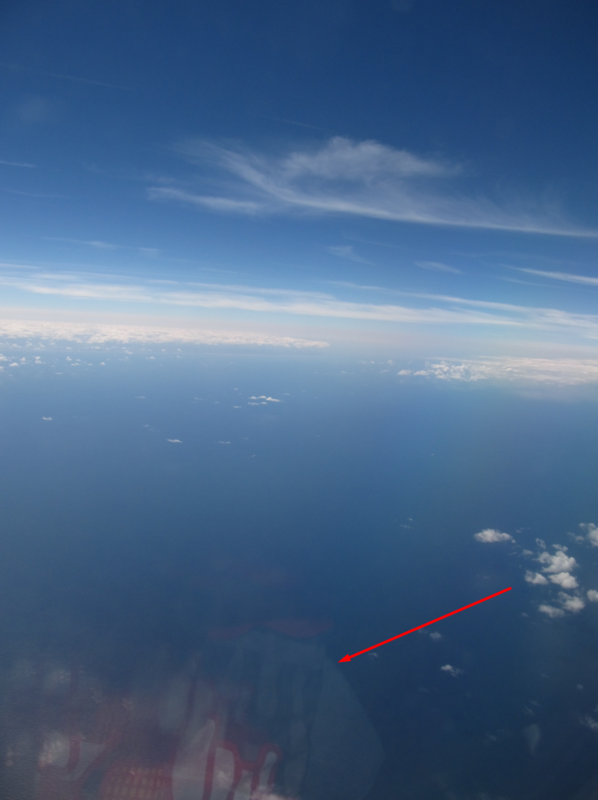 Red arrow shows the direction of my flightseeing (opposite window) (seatguru.com). Pic. 7,8 View in the opposite window. 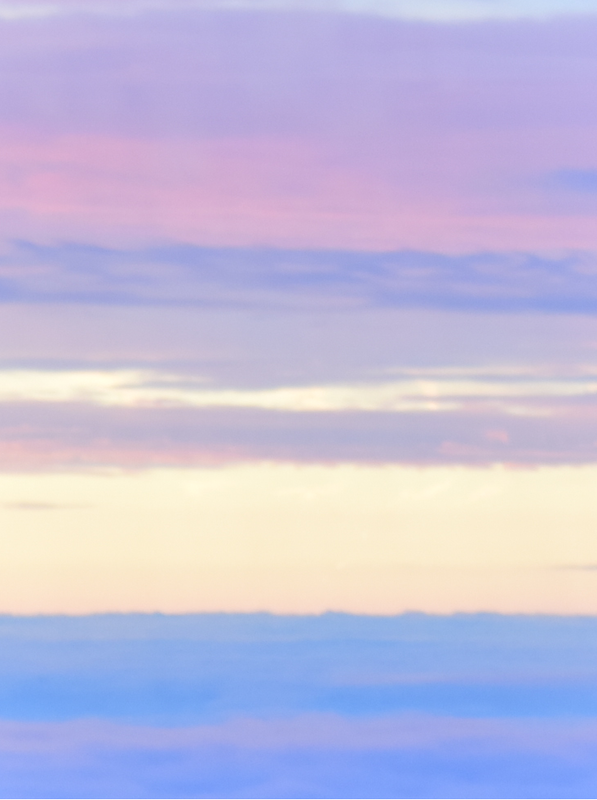 7 – normal, 55mm, 8 – cropped picture. As you may have noticed in the cropped picture 8 the sharpness is not very good. This is an important thing, that we need to work out doing this kind of photography. Bear in mind, that this is hard. After a few attempts I’ve got a quite sharp photos (Pic. 9 – 10). Unfortunately this sharpness will never be perfect, but I will tell more later about it. Pic. 9,10 – View in the opposite window: 9 – normal, 200mm; 10 – cropped picture. Once the opposite window is clear you are very lucky! Most of the time those windows are obstructed by passangers, that are watching something, seating or sleeping. However It doesn’t sound, that you will not achieve your goal! Especially when use a longer lenses (Pic. 11, 12). Pic. 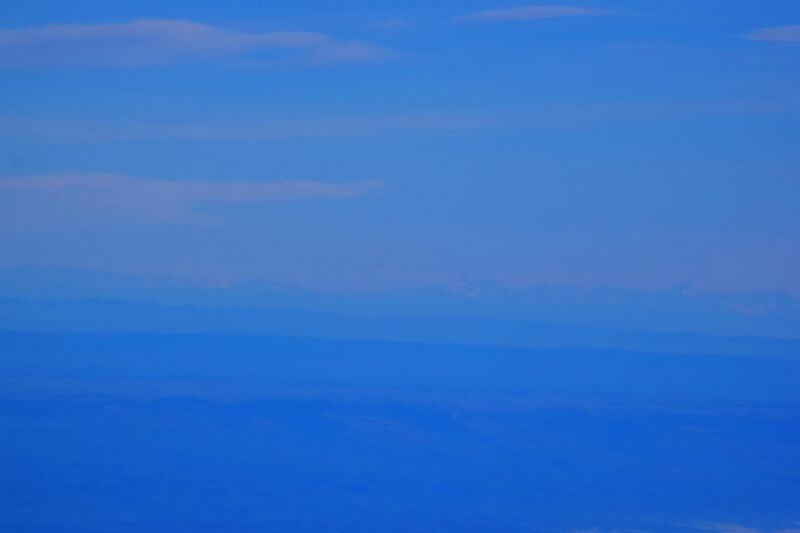 11, 12 The Puy de Dome volcano in Massif Central seen from the aircraft (FR 295 flight STN-TLS): 11 – normal, 300mm, 12 – cropped picture with red line, that shows the Puy de Dome volcano (1465m.a.s.l.) peak from around 160km distance. 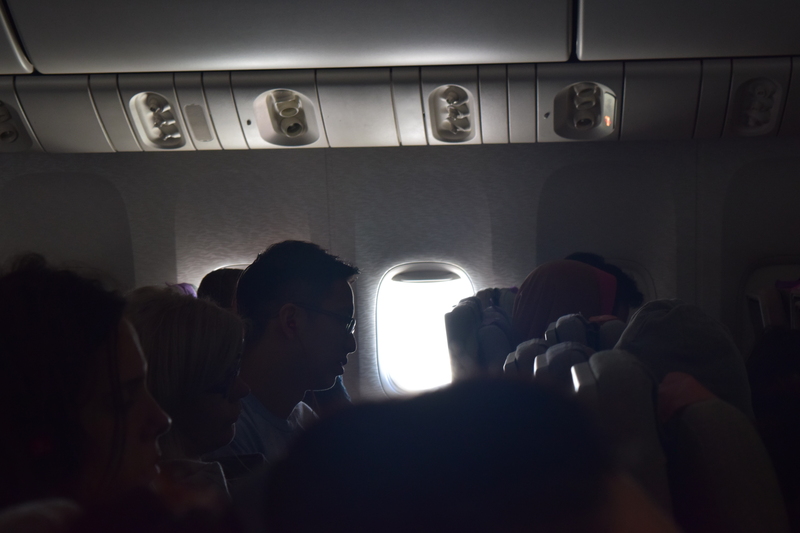 When I was travelling by Airbus A380-800 from Kuala Lumpur to Dubai the flightseeing through the opposite windows was not possible at all. Even when I used a long lenses (Pic. 13 – 17). Pic. 13 My seat during the flight EK 345 (KUL-DXB) and attempts to shoots the view from the opposite window (seatguru.com). Pic. 14 First attempt – picture is too bright. I can’t see any details in the window, 55 mm. Pic. 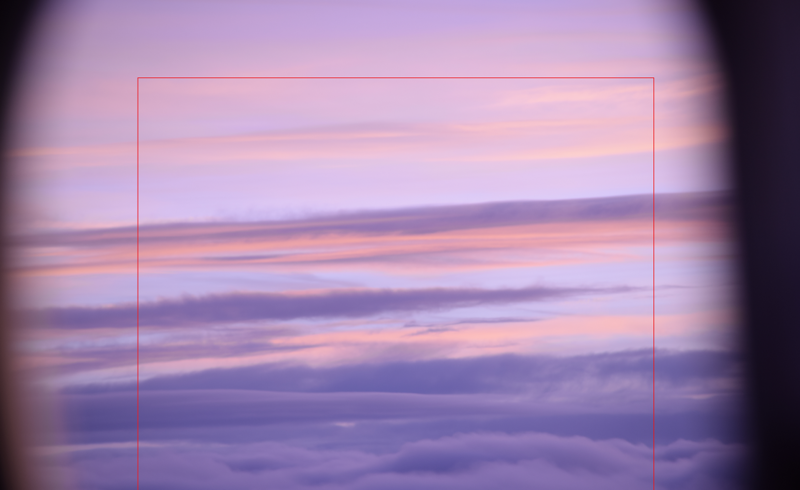 15 Second attempt – I have got a proper picture parameters, however the zoom is too small; 55mm, 1/4000s, f5.6, ISO 160. Moreover the opposite window is mostly obstructed. Pic. 16, 17; 16 – Third, last attempt. 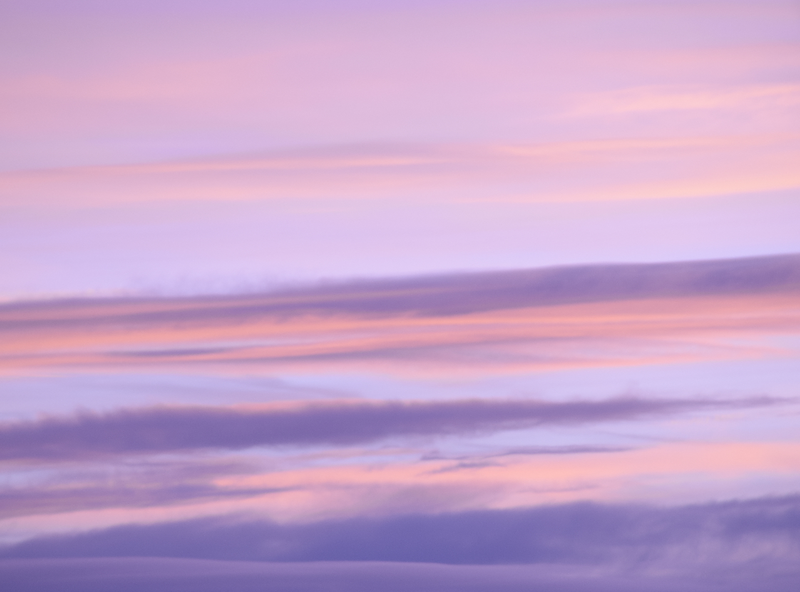 I used 200mm lens to make a shoot of the view in opposite window. Unfortunately I’ve got nothing. Possibly due to clouds. Mostly obstructed window didn’t give a lot of view and thereby a space for cropping the picture; 17 – cropped picture – very faint and featureless view with very poor sharpness. Pic. 15 – 17 shows exactly the issues, that I have rised earlier for Pic. 3 – 5. 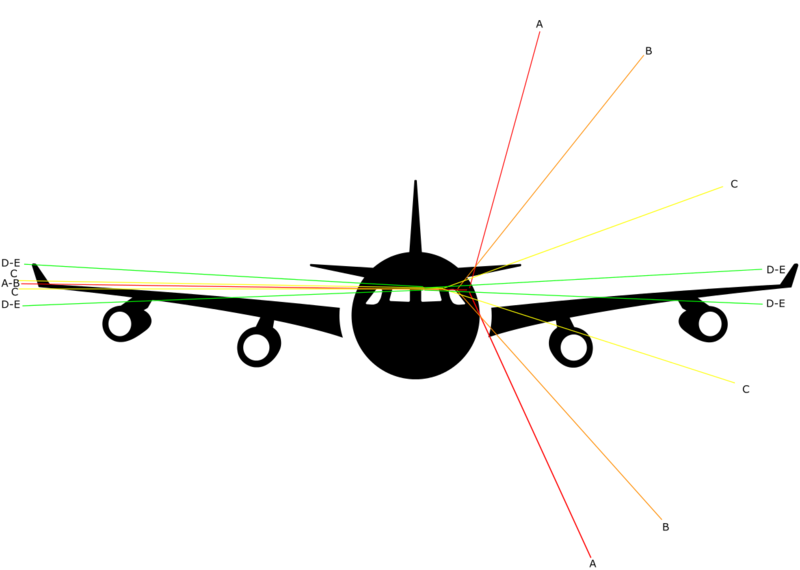 In case of wide-body aircraft you have only one line of sight, that almost always can be blocked by others. On top of that you have to adjust the brightness of your picture. 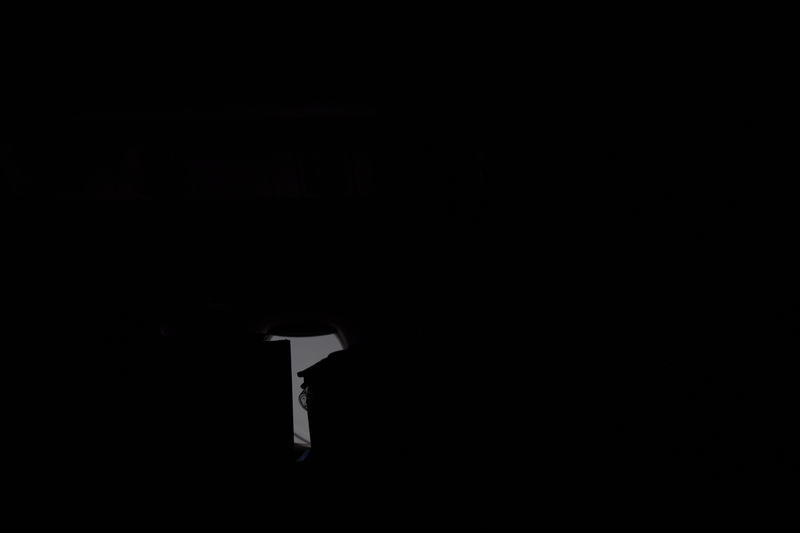 To distinguish the external view from the fuselage is good to make your picture as dark as possible. In general everything says, that flightseeing in this way is not possible even when you are sitting in the middle of the wide-body aircraft. In another part of this article I would like to say more about the long lens photography from the plane itself. I was found, that the longest zoom lens cannot be used in the flightseeing. The reason lies in the window glasses quality. Basically the aircraft windows are made from plexiglasses. This material is light, relatively strong and you can see clearly through it. However the mayor drawback of this is crazing (hairline cracks on the surface of the material), that are caused by temperature, stress, dirt and UV exposure. 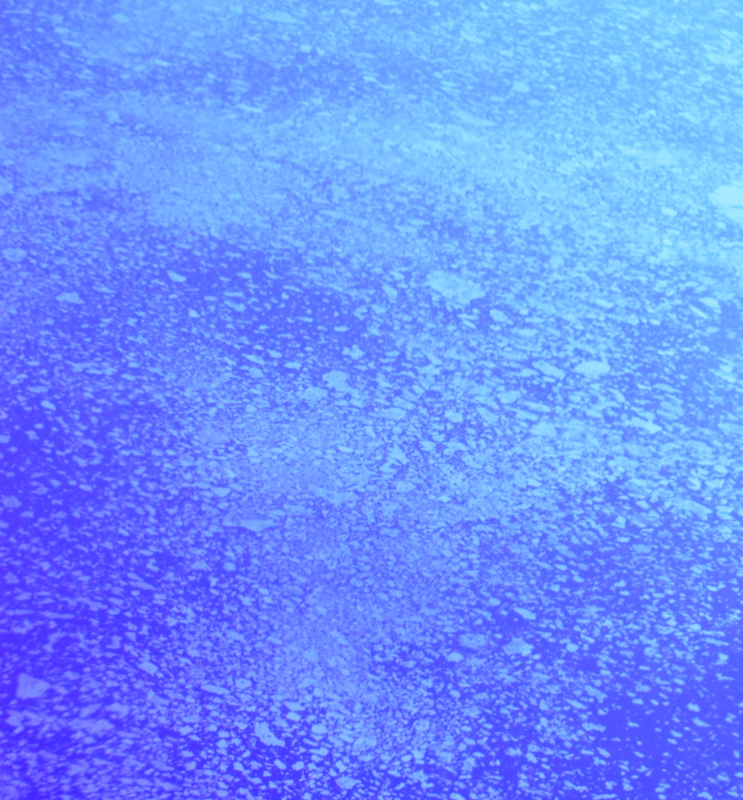 Those cracks are the best visible with frost when flying on high altutude (Pic. 18). Pic. 18 A plexiglass, that is a basic element in the aircraft window. Due to long exploatation some cracks are visible. Many of them is frosted during the flight. 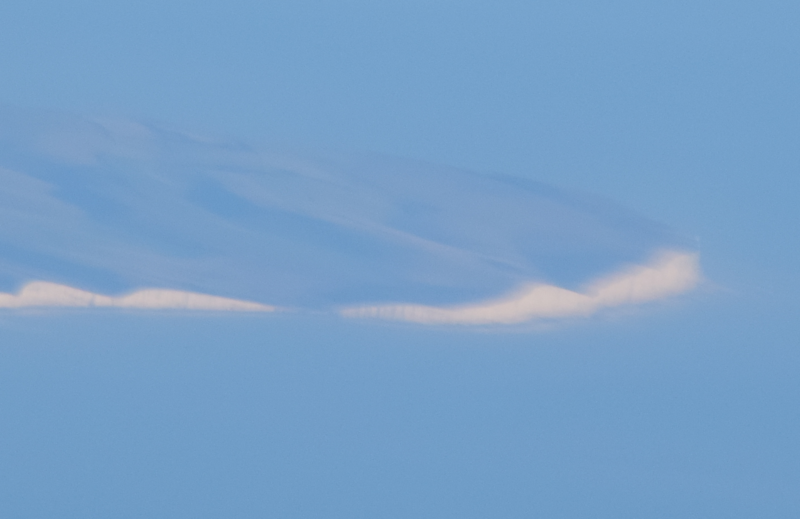 This is one of the reasons, that interfere on the long lens photography during the flight. Those plexiglasses are featured with a decent optic properties, but a lot of crazings bring the photo sharpness down. Another one arises out also from the window design. The aircraft windows are multiple layers thick (Pic. 19). Pic. 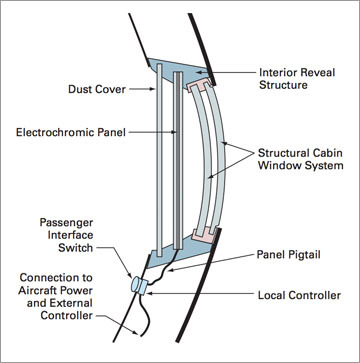 19 Typical aircraft window elements graph (aviation.stakexchange.com). The side facing the passengers is a plastic sheet with the lowest optic quality. Moreover this sheet is not uniform and somewhere on the window there are “lines” or even “areas”, where this window layer has been integrated (Pic. 20, 21). Pic. 20 A good example of nonuniformity the optic quality in the aircraft window. 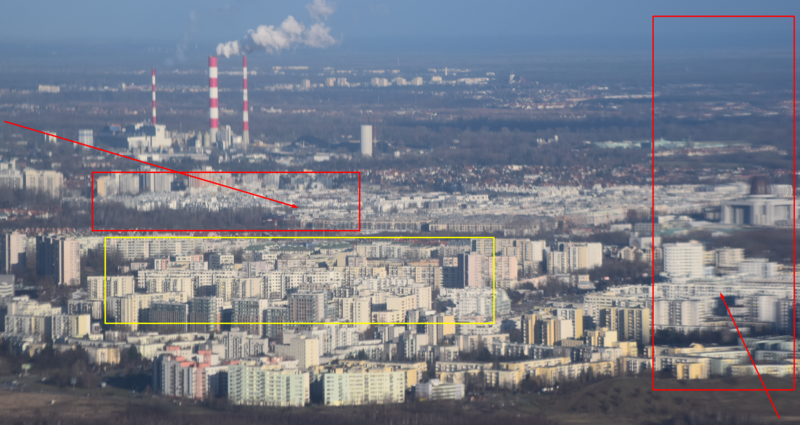 Red rectangled areas are the worst and those parts of image are really noisy unlike to yellow marked area, that is the sharpest in the picture, Warsaw, Poland. Pic. 21 Another “line of distortion” seen in the window after using the zoom lens (marked red), Toulouse, France. 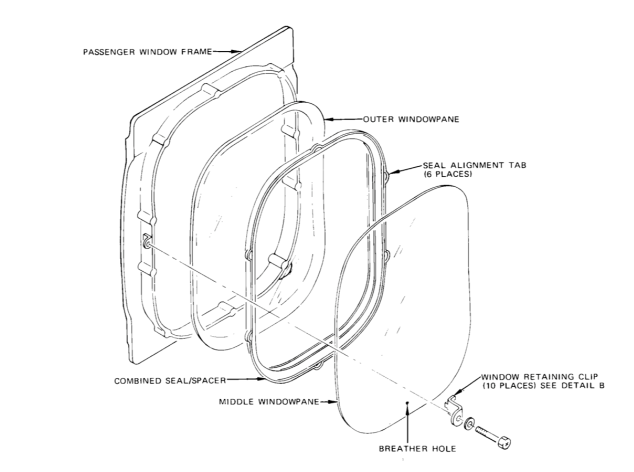 A separate case apply to the Dreamliner 787 windows. I experienced it when I was flying from Oslo to San Francisco by Norwegian Airlines. The Boeing 787 Dreamliner aircrafts has “the best airplane windows ever”, that are equipped with an electronical system responsible for the fast switching light control and gradually dimining effect from clear to dark (Pic. 22, 23). Pic. 22 The Boeing 787 Dreamliner window (aviation.stakexchange.com). Pic. 23. 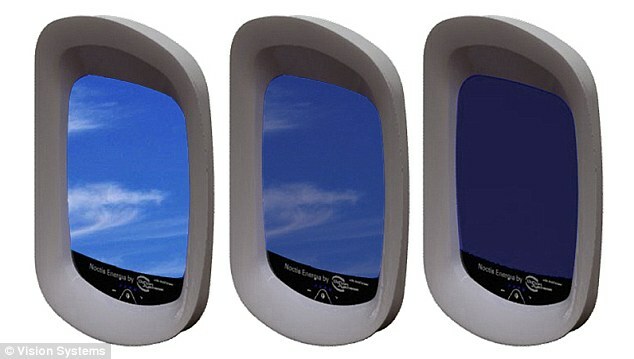 The gradually dimining effect in the Boeing 787 Dreamliner window (scale 1 on the left, 3 in the middle and 5 on the right). Referring to the pic. 21 you have a button, which you can adjust the dimining level to your needs. 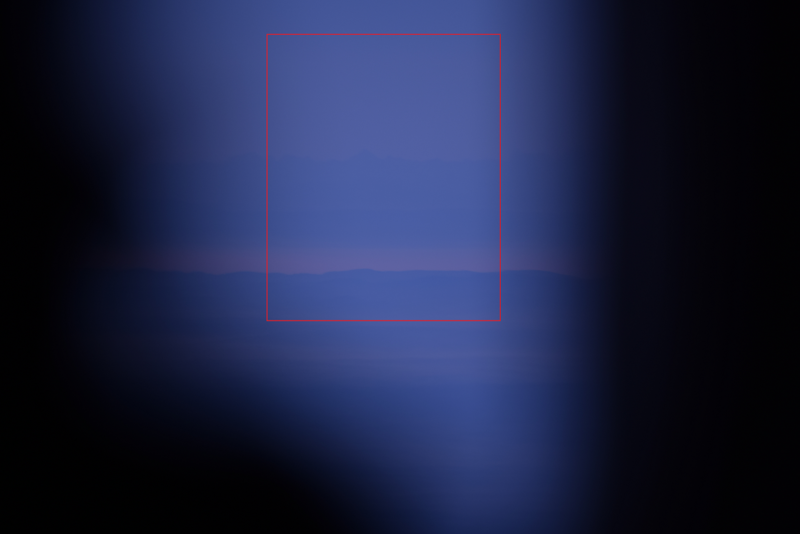 You have 5 levels of brightness, where level 1 means clear view and level 5 completely dark blue window with no sunlight at all. Unfortunately as the image shows this is an local controller only! That means, that someone else can do it for you, what is not necessary for photographers and travellers, who love watching the Earth from the top. At least in Norwegian airlines the cabin crew after the delivering a meal makes all windows darker! They used to turn level 3, whereas you need to have at least level 2 to make your pictures clear! During my journey to United States I was facing the level 3 above Greenland! What a shame! (Pic. 24 – 26). I am afraid, that all airlines, that owe a Boeing 787 Dreamliner can practise this stupid policy! In Norwegian flight passangers were able to make them window clear just before the last meal, around 1,5 hour before landing and nearly 30 mins after the plane passed above the Rockies in south Canada. Great! Pic. 24 A continental glacier covering the biggest insland in the world – Greenland. Flight by Norwegian OSL-OKL with windows dimmed to level 3. Pic. 25, 26 A multitude of ice floes and icebergs on the Davis Strait between the Greenland and Baffin Island, Norwegian OSL-OKL flight with windows with dark level 3. In case of Norwegian (and probably general Boeing 787 Dreamliner) long-haul flights, where the flight personnel makes your window darker without your consent the photography is barely possible. You can get over a little bit this blueness using a higher ISO value or longer exposure, although it doesn’t really works, because the plane is moving fast. 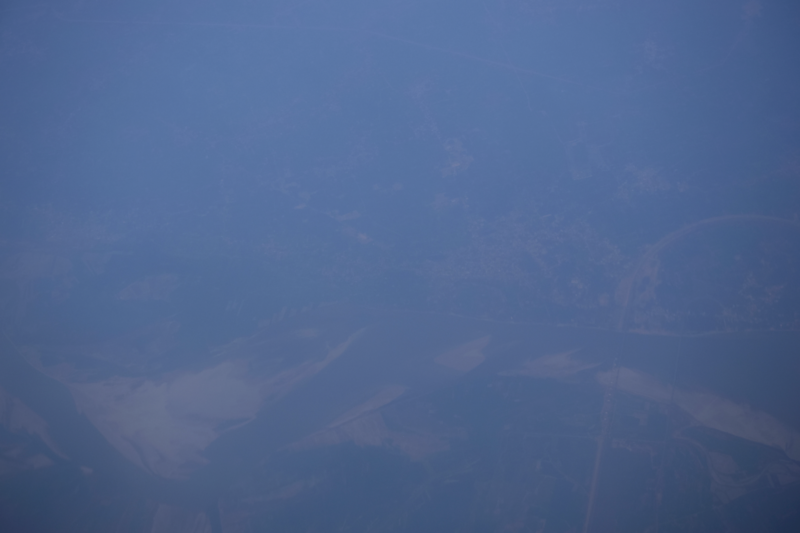 Even when you are at the top o the troposphere using a longer exposure will reduce the sharpness of your picture simillarily to the ISO value, that will make it noisy. There is definitely no option for the long lens photography in this case. Returning to the aircraft window optics quality we need to know, that it will definitely affect on our long lens pictures. Every crack and distorsion on the window is going to be multiplied. At the outcome the sharpness of your picture will be dramatically reduced. I have been doing long lens pictures for more than 1 year and I came to some conclusions how to make the photos as sharp as possible. 1. First of all, even if you are going to make a normal pictures without zoom you have to clear your window! Always, when you entering to the plane and taking your seat the window is quite dirty after previous passanger. 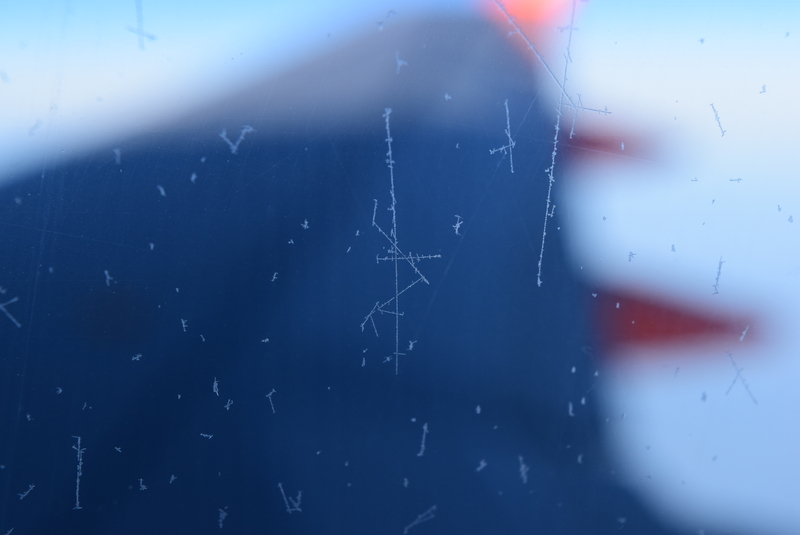 Window can be made dirty by yourself, especially before landing, when you woke up (Pic. 27). Only 1 clean tissue can make it tidy again. Pic. 27. The dirt on the plexiglass (marked red), that partially reduce the photo sharpness, Dubai, United Arab Emirates. 2. Avoid the sunlight, because the sunlight may cause a ghost images. Light is to be reflected on the glass and finally you will see your portrait rather than landscape outside (Pic. 28). When you have got a seat a front of the sun try to capture the landscape not affected by sunlight. Pic. 28 Ghost image caused by sunlight reflected on the plexiglass, flight Ryanair FR 2137 above North Sea. 3. Avoid the window edges, where distortion is much bigger than anywhere! (Pic. 29) and also another “lines” or “areas” of distortion when possible (Pic.20, 21). Pic. 29. 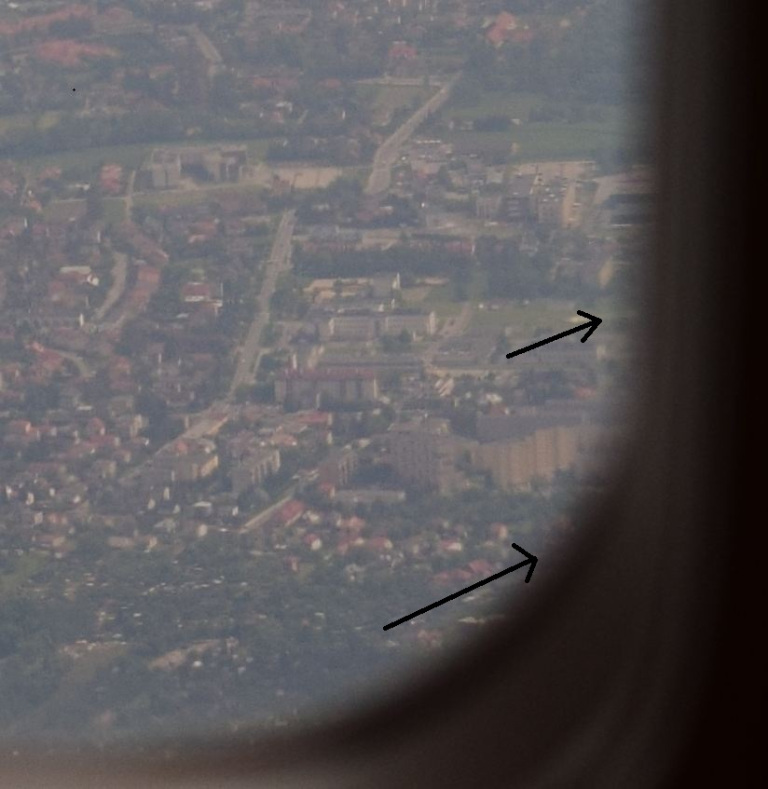 Shooting very close to the window edge will strongly impact on the sharpness of your picture, Rzeszów, Poland. 4. Use as fast exposure as possible, because in the long lens photography even the highest flying altitude may hot help you to make a sharp picture (Pic. 30). Pic. 30 This picture has been taken with 100mm lens. Unfortunately is not sharp, because the aperture was to slow to the conditions, Dubai, United Arab Emirates. When you using the zoom lenses you have to remember, that the parallax is also zoomed in (multiplied). For instance 10x zoom causes 10x higher probability, that your photo will not be clear due to aperture. 5. Remember, that the longest zoom lens, that you can use in the plane is 135mm! I am not kidding. 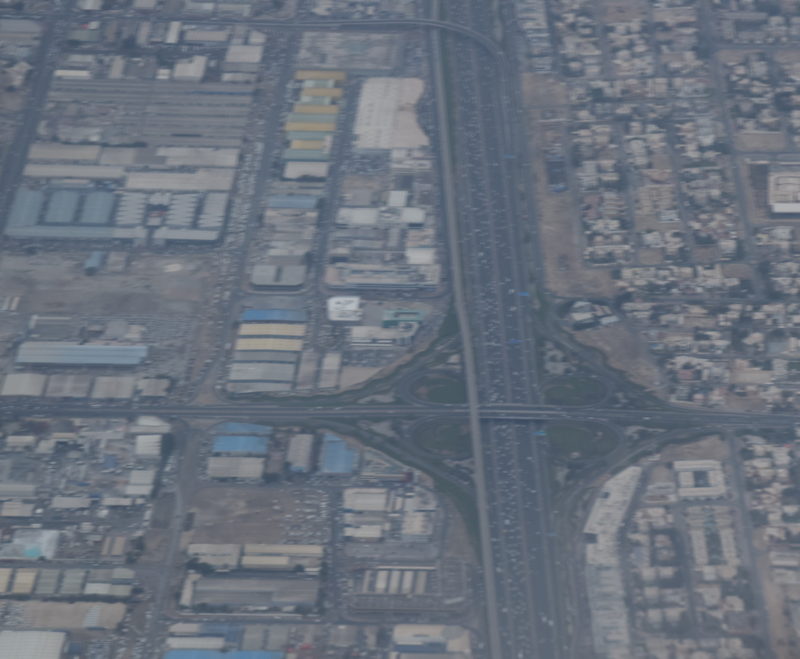 I took a few hundreds photos through the aircraft window and trust me only in a few cases the quality of the pictures zoomed in more than 135mm was sufficient. Mostly the plexiglass reduces the sharpness dramatically for values higher than 135mm. Sometimes even lower value may bring unsufficient effect, however taking pictures with zoom lens up to 70mm in 95% cases gives guarantee of good quality. Pic. 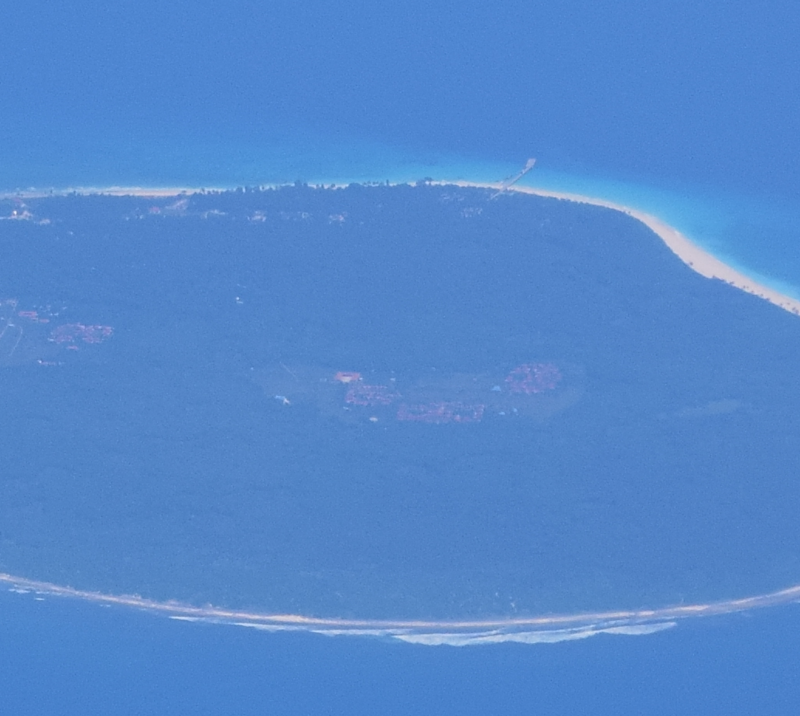 31, 32 Chaura Island (The Nicobar Islands) cropped pictures: 31 – 98mm sharp picture; 32 – 200mm fuzzy image. Pic. 33, 34, 35. 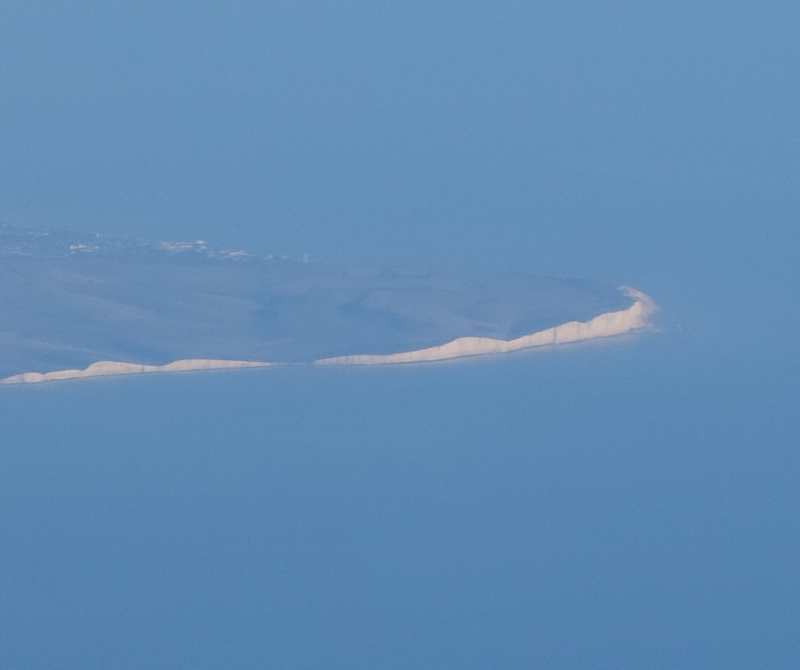 Seven Sister Cliffs seen from the plane, flight FR 296 (TLS-STN), all cropped: 33 – 125mm, perfectly sharp; 34 – 200mm, slightly noisy; 35 – 300mm, completely unuseful. Pic. 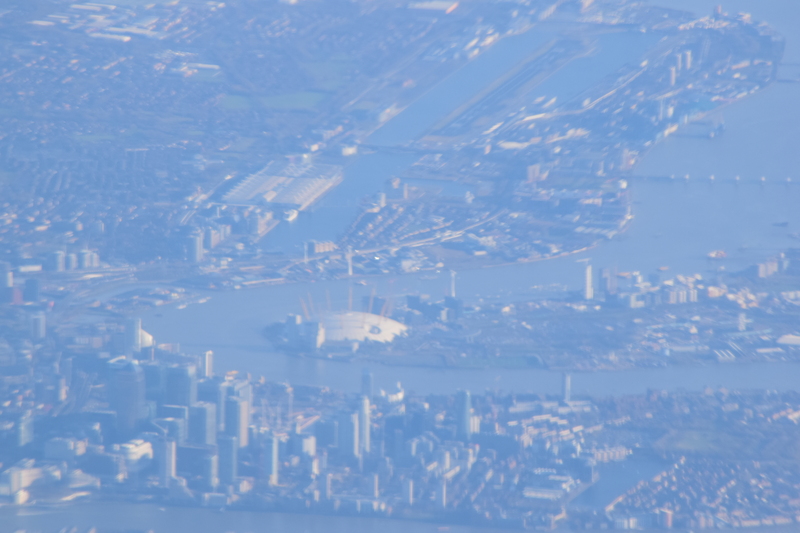 36 Greater London from the plane, flight FR 296 (TLS-STN), 300mm. Pic. 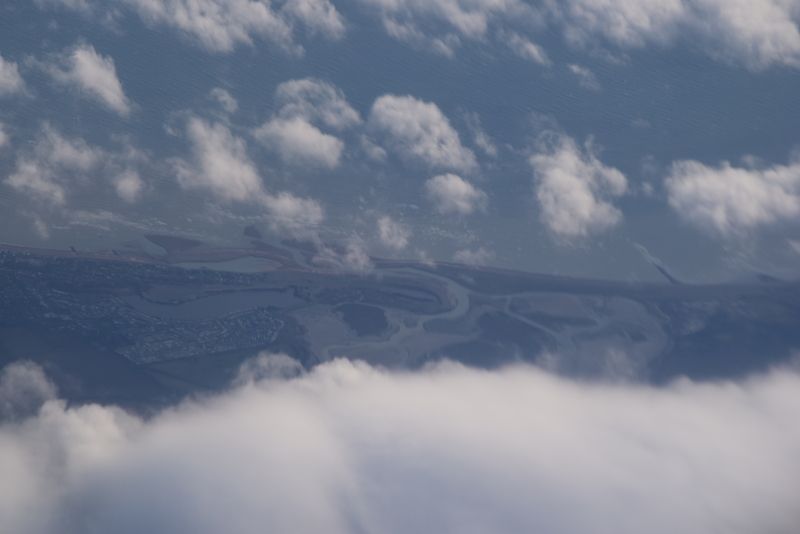 37 Chichester Harbour estuary seen from the plane, 140mm, flight U2 3214 (PMI-STN). Pic. 38 Ryanair FR 8321 flying from Stansted (STN) to Valencia (VLC) seen from Easyjet U2 3213 flying from Stansted (STN) to Palma de Mallorca (PMI), 300mm and unfortunately fuzzy picture. At the finish I would like to share with you the panoramas issue. Returning to the very top of this article, where I said, that our viewshed should be extended a lot. 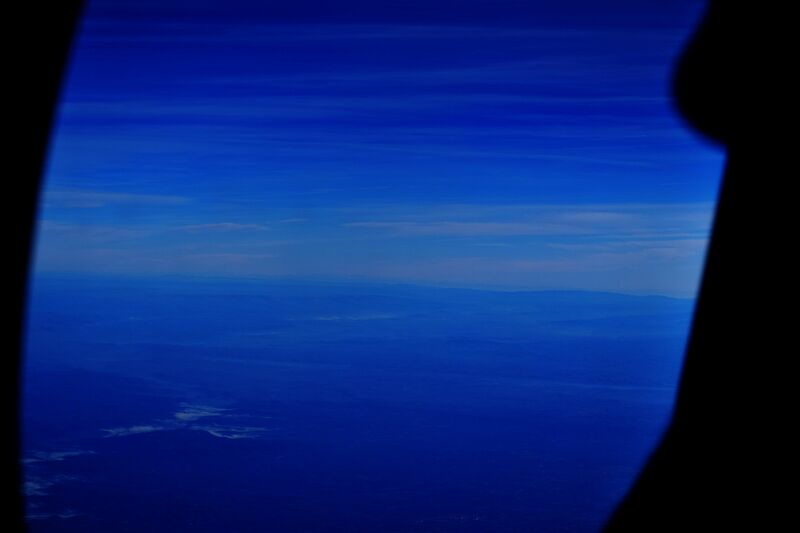 Knowing, that the plastic layers and plexiglasses in the aircraft windows provided slightly deformed optic view of the landscape we shouldn’t expect a perfect long distance views. Another factor is obviously the atmosphere. However there are a rare examples, where you can cover some mountains on an impressive distances. In that case you will not see more details than outline only, but you will enjoy anyway. 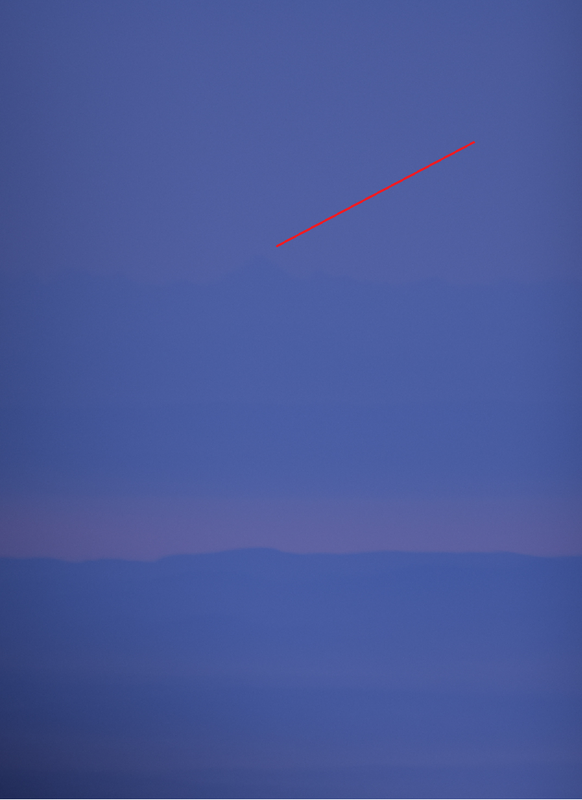 When I was flying from Toulouse to London Stansted on December 2016 I was fortunate to witness the longest visible distance ever! 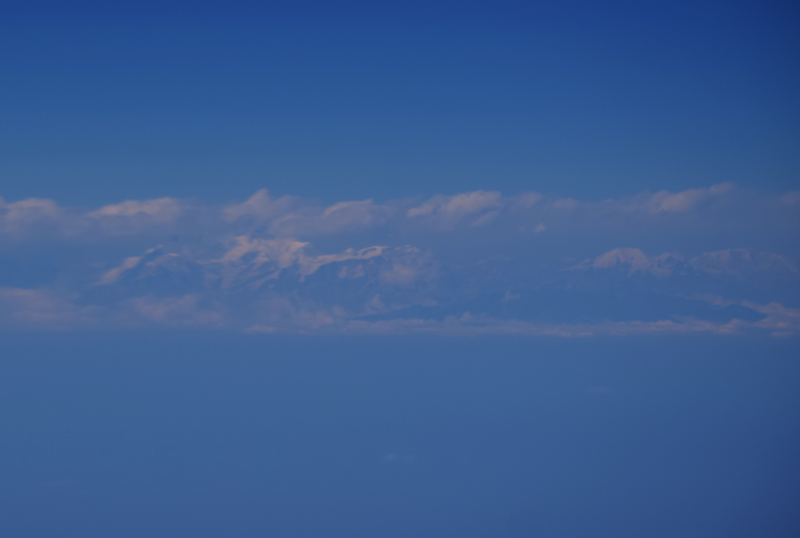 I saw the Alps from around 450 km! (Pic. 40 – 42). Unfortunately I can’t boost my record, because my observation was not carried out from the surface or the object enduringly associated with the ground (like tower, TV transmitter, etc.). Current world record of distance landscape photography is 443 km, so my record would be around 7 – 10 km longer (Pic. 40-42). Pic. 40 – 42 The french Alps seen from the aircraft window during the flight FR 296 (TLS-STN), all pictures with modified gamma: 40 – 55mm general picture; 41 – 300mm probably with the Grandes Rousses group (Pic Bayle – 3465m.a.s.l.) on 435-440 km distance; 42 – 300mm with Dauphine Alps (Barre de Ecrins 4102 m.a.s.l. 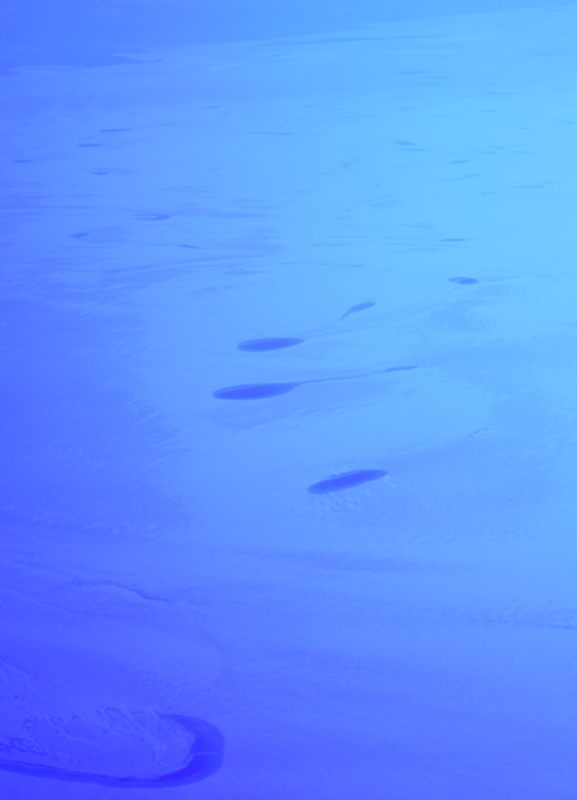 marked blue) on 445 – 454 km distance. Pic. 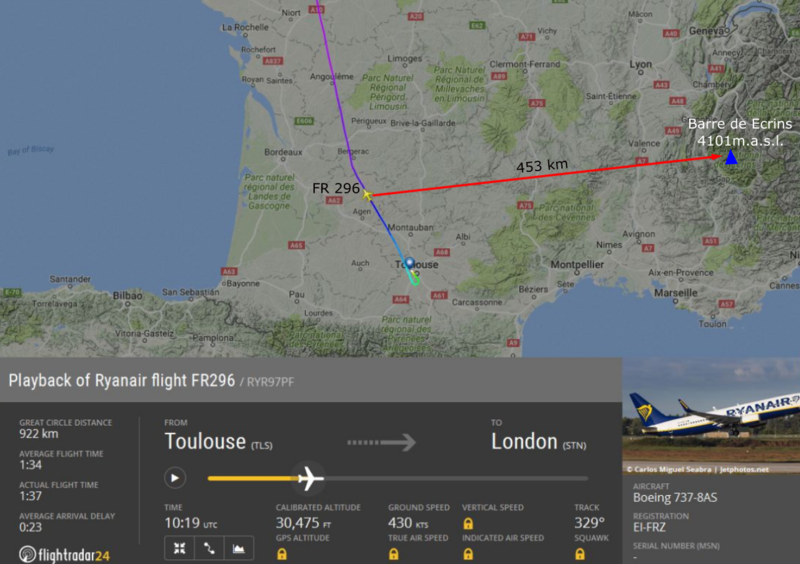 43 The proximate position of FR 296 flight (TLS-STN), from which the Dauphine Alps and Grandes Rousses were visible. 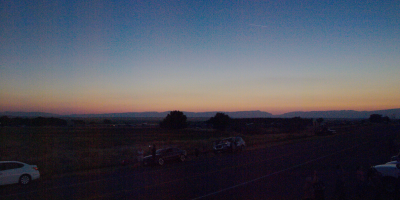 According to udeutschle panorama generator from this position to the highest and the furthest peak at once was 453km! Pic. 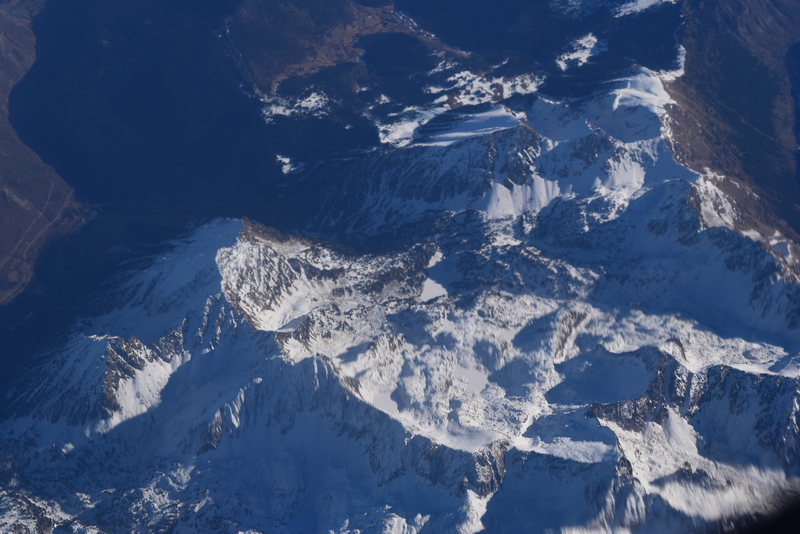 44 The general panoramic view (5x zoom factor) from the FR 296 flight towards french Alps (Grandes Rousses on the left and Dauphine Alps on the right) (udeuschle.selfhost.pro). This observation was really fortunate that time. 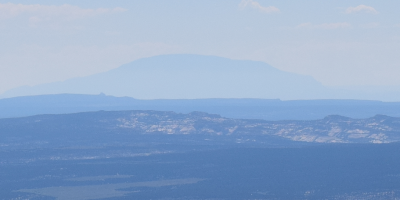 In spite of plexiglass distorsions and cracks I could quite clearly see the mountain outlines and moreover I was able to see the snow on the top (Pic. 41). Unfortunately the plexiglasses in the aircraft are not the same. One flight may differ much from another. 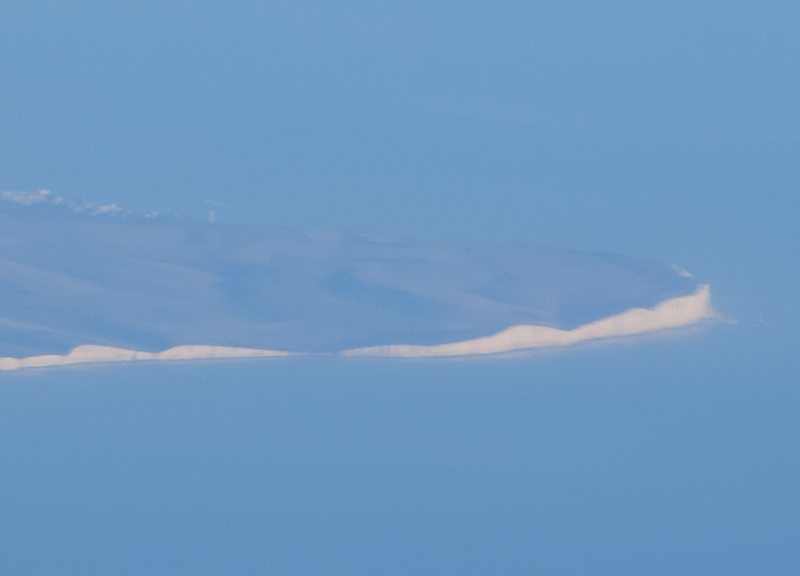 For instance during the next time when I was returning from Mallorca I couldn’t make a similar effect using 300mm lens (Pic. 47 – 50). I had problems even with a small zoom (Pic. 47-50). Pic. 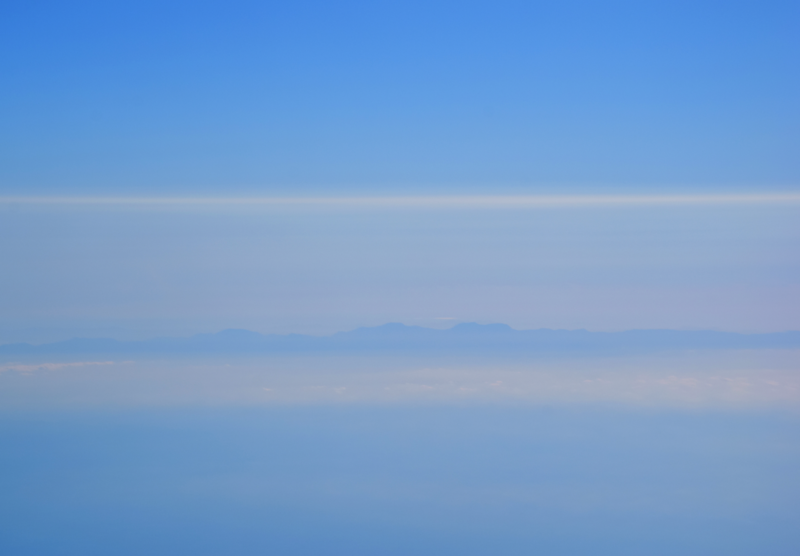 47-49 Sierra de Tramuntana seen from flight U2 3214 (PMI-STN) above Barcelona (180 km distance) with the most prominent Puig Major (1415m.a.s.l.) and Puig de Masanella (1364m.a.s.l. ), all pictures with gama & contrast modified: 47 – 300mm, quite fuzzy outline; 48 – 135mm, relatively sharp; 49 – 55mm – sharp. Pic. 50 One of the very rare examples, where even small zoom lens (55mm) can’t provide a good picture quality, because of too many cracks and distorsions on the plexiglass, Pyrenees Mts, Tuc de Molieres community and Val de Mollieres. At the very end of my article I would like to share the newest flihtseeing long lens photography from my last journey from Dubai to Manila, when I was able to see the Himalayas Mountains (Pic. 51 – 54). Pic. 51 Sishapangma (8027m.a.s.l.) 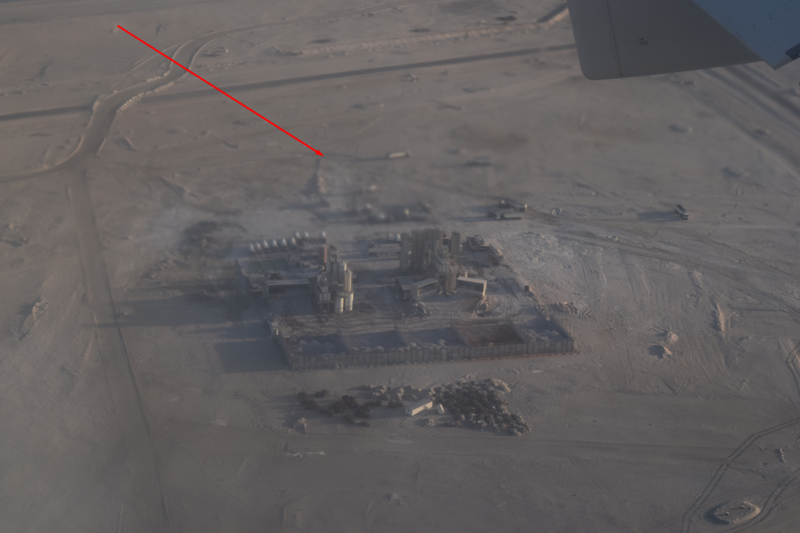 seen from around 310 km distance during the flight EK334 (DXB-MNL), 120mm, cropped with gamma & contrast modifying. Pic. 52 Himalchuli (7893m.a.s.l.) 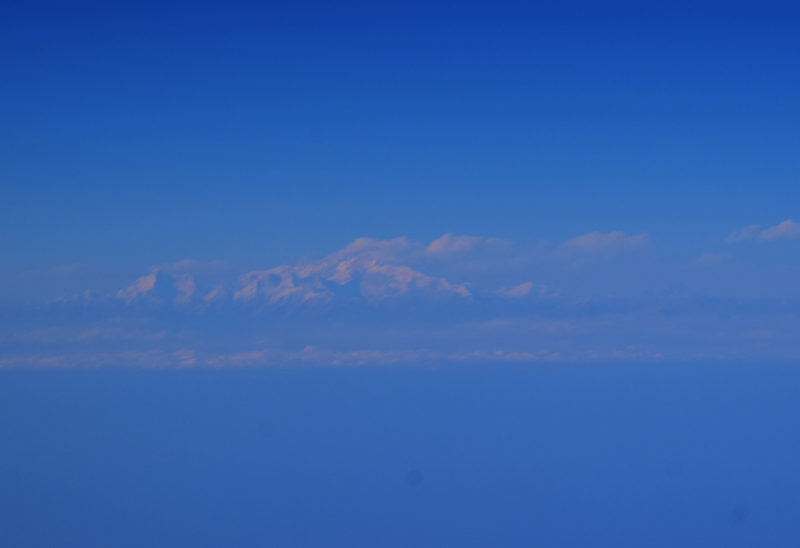 seen from around 340 km distance during the flight EK334 (DXB-MNL), 98mm, gamma & contrast modified. Pic. 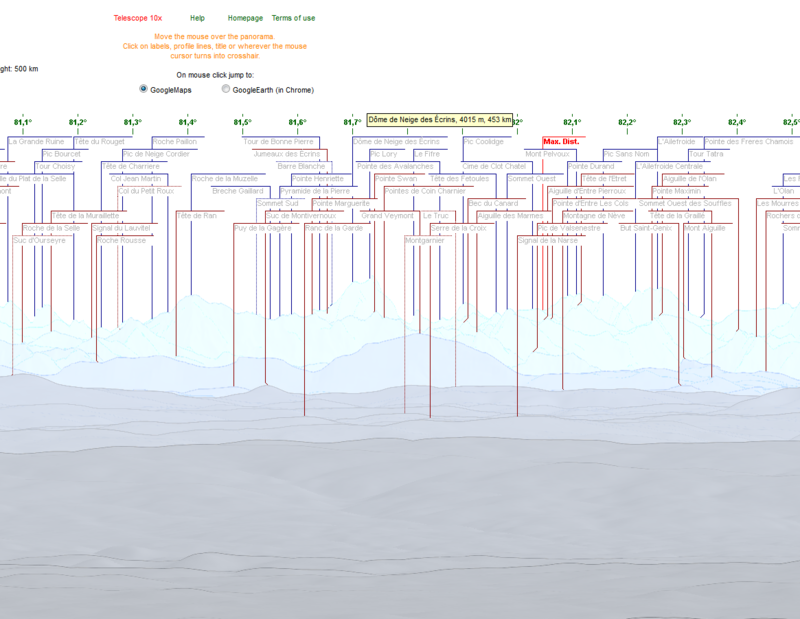 53 Mount Everest (8848m.a.s.l. ), the highest peak of the World was in the clouds and Tutse (6758m.a.s.l.) 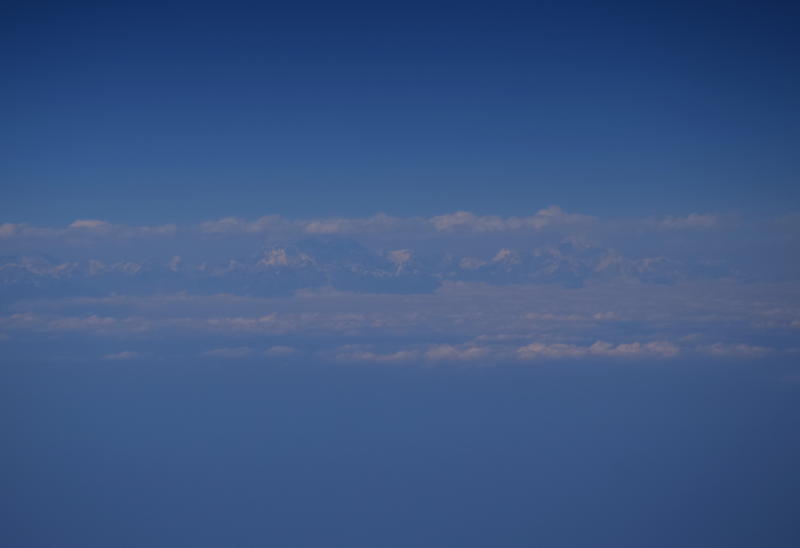 on the right seen from around 290 km distance during the flight EK334 (DXB-MNL), 98mm, gamma & contrast modified. Pic. 54 The Kangchenjunga (8586m.a.s.l.) 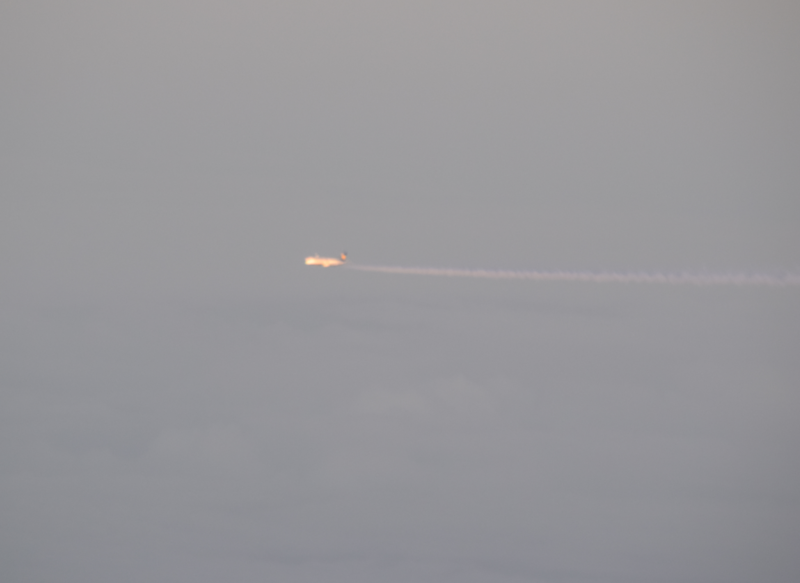 seen from around 270 km distance during the flight EK334 (DXB-MNL), 240mm, gamma & contrast modified. And the Ganges river just under me :). Pic. 55 The Ganges river with the bridge near Bhagalpur and Raghopur, 55mm. 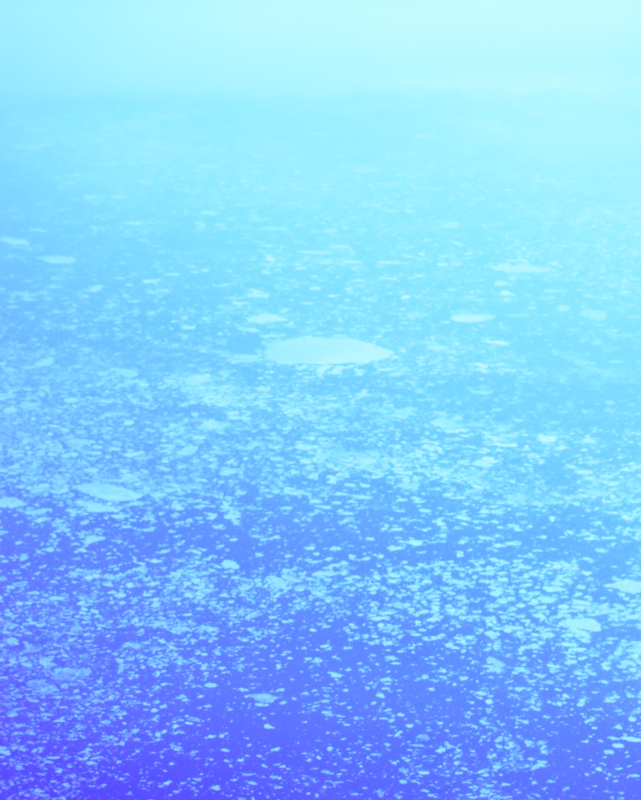 Due to poor visibility conditions in this area I had to modify the gamma and contrast to enhance this view. Summarizing, the biggest lens, that you can use in the plane is 135mm. It gives you guarantee to have a nice and sharp pictures. This is still a big zoom, that allowes you to have around 8x zoom factor comparing to the kit lenses (17-18mm). 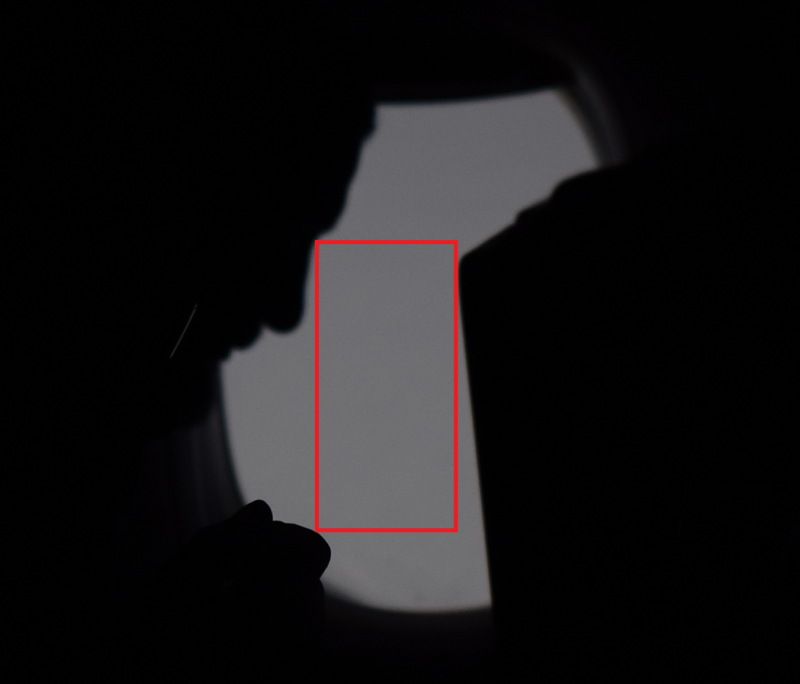 Why is there a hole in one of the layer of an airplane’s windows? How to capture a landscape from the middle of the plane?